I’m considering decorating my cubicle with this. Did you notice the handy .pdf download links? It would be even more telling if the streets were also in color. “They paved paradise to put up a parking lot,” you know. It appears that downtown is suburbanizing itself, by attrition. Yuck. How about a big municipal lot that connects to the train station and a free bus that just goes in a loop? umm… could you make the colors slightly more contrasty, instead of ‘dark orange’ and ‘light orange’??? like blue and yellow, or green and red, or something like that? so the different spaces are more easily spotted??? 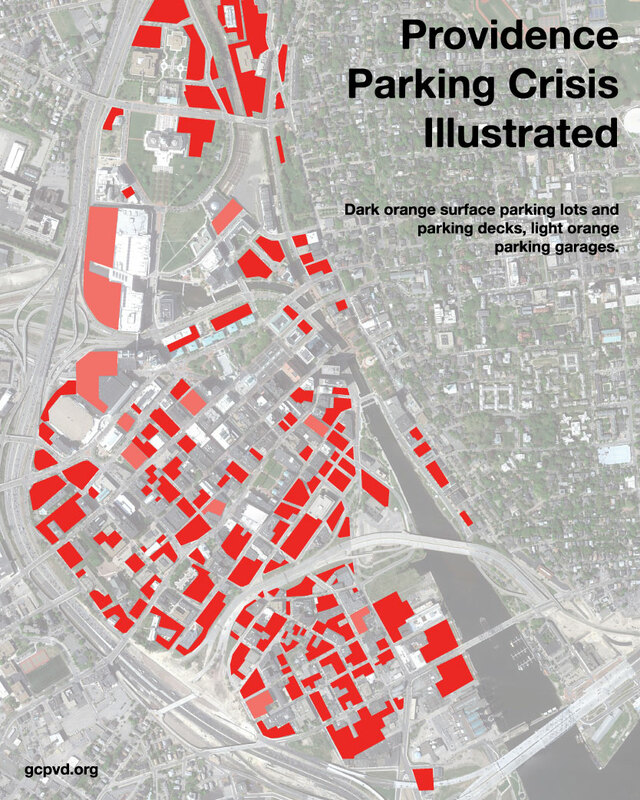 I think that the JD needs 7000 more parking spots before anyone will come to the CBD in Providence. Interesting online piece here about why people get so worked up about parking and why offcials are loathe to make changes. I should also point out that the posted comments to that article are extremely insightful.